Have You Heard of Happiness Economics? 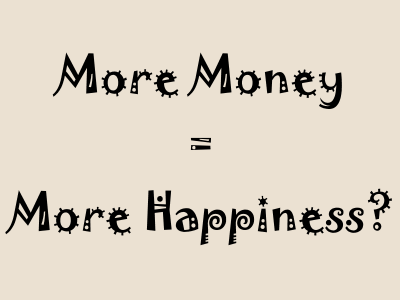 The Money Ways » Economy » Have You Heard of Happiness Economics? Yes, that’s right, economists have actually tried to quantify the relationship between money and happiness! They refer to this field as happiness economics. According to studies from two professors at Princeton University, they have actually come up with a formula that measures the relationship between happiness and money. Unfortunately, since it’s an economic formula, the inputs are not easily quantifiable, but they were able to draw a conclusion about money and happiness. And guess what, it says that the more money you have, the happier you are. Day-to-day happiness increases as income approaches $75,000 a year, but then levels off. I guess this makes sense right. After all, if you make very little money and have difficulty paying the bills, you are likely going to be stressed out and worried about your finances and lifestyle or family. This would cause unhappiness. As you make more money, you can not only worry less about the bills but you can start to buy items that make you happy, like vacations, big screen TVs, and other material items. When you approach a certain income level ($75,000 according to this study), the increased happiness from the new purchases stop adding as much pleasure as they used to. I guess that would be why the happiness factor starts to level off. Of course, one can easily argue that the equation is too generalized, and I would guess that each person has their own equation that has a much different figure than the $75,000. For example, if you live in Vietnam and prosper on $10 a day, the magic number would be much less than $75,000. However, if you live in San Francisco or New York, $75,000 would barely be enough to pay rent and living expenses, and the happiness figure would be much, much higher. Other things that affect happiness, of course, are non-monetary things like the quality of your social life, the climate and love of where you live, and the joy you get from friends and family. However, these also vary dramatically by individual and are in no way quantifiable. So, after reading about this crazy new study called happiness economics, do you have any comments to share? We can’t deny the fact that in order to live each day, we need money to buy our foods, pay for our bills, mortgages and loans, car gasoline, bus and train fares, and the list goes on. In today’s standards, almost every actions require the use of money. As a political science professor, I am a little familiar with this topic. All I can say is that you have pointed the two sides of this story and you presented instances that happen in our daily lives well. In my opinion, I believe that more money doesn’t necessarily equate to more happiness. Look at the lives of the rich and the famous in Hollywood and in the political arena, there is not a day that they are the sources of daily news. So it still boils down to the idea that happiness is a non-monetary issues. Regardless of how much a person earns, happiness weighs more on the amount of love you receive from the people around you and not from the material things you possess. Next post: Is Living in a Frugal Way Worth It?